Role Model/Hero: Sister Madonna Buder who finished the Kona ironman at age 78. This is my favorite team going into the season. All the others seem to be kind of average, but these two seem really nice and easily likable. I also love the new bios! They give a little more insight into each person's personality than the old ones did. They seem to be entertaining and has new dynamics unlike all young and boring couples / young and boring siblings. Go Jody and Shannon! Same. Jody could be a physical liability, and I don't think Shannon can make up for them like Nicolas could for Donald. i think they will be eliminated becuz they made a bad roadblock decision and Jody did the RB. I feel they'll be out early, but not due to not being able to keep up with the other teams. i think their downfall will come from some freak incident (bad taxi, having bad luck at a luck task, getting lost, bad connections, etc.) i feel they'll be able to perform each task relatively well. An interview with team Texas that's mostly about their workout regimen but also discloses the fact that, like the Wangs, they were a recruited team. Wow, thanks Slowhatch!! Sounds like they did all they could and more to prepare!! Is she the oldest ever to take part in TAR? Or the oldest woman? but its still correct, right? 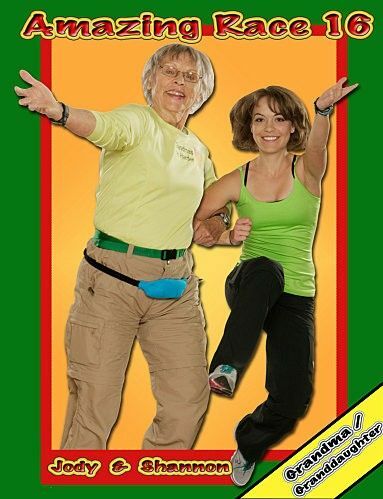 Jody Kelly and Shannon Foster, one of the teams on season 16 of The Amazing Race, aren't your typical grandmother and granddaughter. At age 71, Jody is one of the most active people in the history of the race, running half marathons, lifting weights, all while her granddaughter follows suit. The pair got off to a rough start on the first leg of the race and was never quite able to make up the ground they needed to in order to stay in the race. They were eliminated on last night's episode, at the end of the second leg. Today, they spoke to RealityWanted in an exclusive interview about their experiences on the race. Q. Gina, RealityWanted: Whose idea was it to try out for The Amazing Race this season? A. Shannon: Gram was definitely the one who went all out for it. It took a little bit to convince me because I just graduated from college. It didn't take long before I was like, "Life is an adventure!" Q. Gina, RealityWanted: Did you do any preparation before heading into the race? A. Jody: A lot. We continued with our previous training with triathlon stuff and stepped it up with pilates. I did some extra things with weightlifting. I slept out in my car and on the floor and I did some sudoku to overcome my fear of numbers. Q. Gina, RealityWanted: You both live a very active lifestyle. Was running the race easier or harder than you expected? A. Jody: Easier. It is much, much harder to run a half marathon. I've done there of those. I'm going to do a full marathon within a year and I'm going to do my first half iron triathlon. A. Shannon: I thought it was harder, just because of the physical, mental, and emotional energy. Q. Gina, RealityWanted: What do you think of the alliance that Joe and Heidi formed with Carol and Brandy, when it comes to things like saving spots in line or sharing information? A. Shannon: You do what you gotta do when it's to your advantage. Carol spoke Spanish so it made sense to align with them. I think there would be backstabbing down the road and people would run their own race. A. Jody: It's a game. It's not sitting around singing kumbayah. I don't think anyone ought to complain about alliances. Q. Gina, RealityWanted: Were there any teams on the race that you connected with? A. Jody: Not on the race, no, we were pretty far behind... a little bit behind at any rate. We didn't get the opportunity and we didn't have that much of a desire either. Q. Gina, RealityWanted: What do you think contributed to the downfall of your team, in this second leg of the race? A. Shannon: I think that we did start behind everyone else and that was not to our advantage at all. We did make decisions really fast but we didn't have very much information about the detours, with the condors and the llamas. The llamas did take us longer. Q. Gina, RealityWanted: How difficult is it to make up ground when you start the bottom of the pack? A. Jody: Pretty darn hard. A. Shannon: It's pretty difficult unless someone else makes a mistake. Louie and Michael did make a mistake but we weren't able to pass them. Q. Gina, RealityWanted: How far after Louie and Michael did you reach the mat? A. Shannon: I'm not sure the exact time but it wasn't that far behind. A. Jody: Between 15-30 minutes. Q. Gina, RealityWanted: Despite going out early, are you satisfied with the experience and proud of how you ran the face? A. Jody: Oh, I'm thrilled to have done this together with Shannon and it's a relief not to be the first one out. A. Shannon: We were still hoping to go pretty far. We were pretty bummed out. We did the best we could with what we had. A lot of it was luck of the draw. It is what it is. A. Jody: I'm very, very happy that we were always pleasant with each other and positive. Q. Gina, RealityWanted: Are there any teams that you're rooting for to make it to the end? A. Jody: We love them all, we really do and we wish them all the best. It's way too early to predict a winner. A. Shannon: I just signed up for my first marathon in June. I'm living in Alaska. A. Jody: I'll probably go up to Alaska in July and do a really long bike ride with Shannon and her mom. I'm going to enter a half marathon probably in September. I'm going to do a power lift meet in December. I have all kinds of things going on. Thanks for the interview, georgiapeach. Jody Kelly, 71, got a good-ol' kick in the head on The Amazing Race when a cow clubbed her during Sunday's Roadblock. "I was not expecting it at all," she tells TVGuide.com. "I was so close to finishing and before I knew it, milk was everywhere and I had to start over and milk another cow." The setback allowed detectives Louie and Michael to catch up to and pass Jody, a triathlete, and her granddaughter, Shannon, 22, leading to the pair's elimination. But the axed teammates have no hard feelings toward the cow. Find out why. TVGuide.com: You were so close to finishing the Roadblock. Was it the cow's fault you lost? Jody: [Laughs] Oh, no! I would never blame the cow! I've milked cows before and it happens. It was just unfortunate since I had to start over, and milking can take a long time depending on how much milk the cow has. It shook me up, but I was fine. I just got another cup and went to another cow. The medical staff ... looked at me later. But I'm not mad at the cow! TVGuide.com: Were you surprised to see Louie and Michael catch up to you there? Jody: Definitely because we had a pretty good feeling we were last, so it was a shock to see them come in. But it was also good because it told us that we were still in it and had a chance to move on. TVGuide.com: What were you thinking when they passed you? Shannon: Well, I was standing by the clue box, so I saw Michael find the pantry and get the other ingredients. Once he did that, he was done. I so badly wanted to yell out to Grandma where the pantry was, but I couldn't because it's against the rules. Jody: We still thought we had a chance. Anything could happen. Louie and Michael got lost once; maybe they'll get lost again. Who knows? TVGuide.com: Do you know how far behind them you were? Shannon: Not exactly, but it was close. When Phil told us we were last, we were hoping it would be a non-elimination leg. Jody: I was thinking maybe it's a good thing we got eliminated and not Louie and Michael because I couldn't imagine the grief they would get at the police station if a 71-year-old grandmother beat them. [Laughs] Of course, I would've loved to stay, but that's how I think of it now. TVGuide.com: You were trailing from the start of the leg since you got on the last bus. Did you try to catch an earlier bus like some of the other teams successfully did? Shannon: Yeah, we asked everyone if there was an earlier bus, but there was nothing. I think it was because we got there so much later that everything was booked. Knowing you're last, you definitely feel like you need to do everything you can to stay in, and at that point, we were stuck. ... The llamas Detour took a while too because everybody already dressed the llamas that were more friendly, so we had to run after the really stubborn ones. At one point, I slipped and fell on the llama poop. [Laughs] Then I saw one of the dressings come off one of the llamas and I was like, "We're doing that one!" TVGuide.com: No senior citizen has ever won the Race. Don, at 68, came the closest when he finished third on the 12th season. Do you think a senior citizen can or will ever win? Jody: They ought to have an AARP version of the Race! [Laughs] Yeah, we were hoping to do as well as Don did. I'm the oldest person the show's ever had. The average age on this season was 36. With that, it's certainly not likely that a person my age would win, unless there are a lot more older people on it, and that's not likely to happen. I think we had the most diverse age range in the history of the Race. Shannon: A lot of the Race is very, very physical. I think there should be more mental challenges, but most of the tasks right now tend to be physical. If there is a fair balance, then I think definitely a senior citizen can win. TVGuide.com: Was your game plan to have Shannon do the physical roadblocks and Jody to do the less physical ones? Shannon: Yeah, Grandma said she'll do the cooking since I'm definitely not a cook. She actually knew what kuchen [a Chilean cake] was when she read the clue. I don't think anyone else knew what it was, so she was like, "Well, I can do this one." We didn't know it was so much running around or getting hit in the head with a cow. Jody: We thought it would actually be baking a cake, not finding the ingredients for it. You can play "what if?" all day long, but I really feel that if Shannon had taken that roadblock, we might have not been eliminated. You can't tell. We have no regrets. TVGuide.com: Jody, a lot of fans are in an uproar because you said you favored Shannon out of all your grandchildren. Jody: Oh, I didn't say she was my favorite. I said I admired her the most and that's because I know her the best. I've got eight other terrific grandchildren. Shannon and I had this opportunity and she jumped for it, and I admired that about her. I admire that she's an honors graduate from college and she's taking the risk of changing career fields and going into the medical field now. I do love all my grandchildren. TVGuide.com: What are you guys doing now? Shannon: I'm training for a marathon. Grandma's training for a [half-triathlon]. Jody: I've located a [half-triathlon] that will be in September and if I can possibly get myself trained up for it, I'm going to enter it. You were at the farm before the second-to-last team. Editing made it look like you were neck-in-neck. Jody: We don’t know how exactly close we were to Michael and Louie in terms of checking in, but we were not all that far behind them leaving the farm. I would certainly guess we got to Phil less than a half hour after them. Jody: I was a little rattled after the [cow] kick in the face. I could also not wrap my head around the fact that the pantry was outdoors in a shed way behind the house. I went all over the place looking for it. Shannon: The task before with the llamas actually took us longer. By the time we got there, the tamest llamas had been dressed. We were left with the stubborn, aggressive ones and I kept trying to rope these mean llamas for over a half hour. Finally, I saw that the dressing had fallen off one of the others. Then it was easy. They say never work with children or animals and you certainly learned why animals are included in that advice. Shannon: I’m definitely not a fan of llamas. I got way too much llama poop and spit on me. Jody: The cow kick was worse. I had a bump on my head afterward. At the moment, in a state of supreme surprise and competition, I minimized the pain. I really did whip right around and go to a different cow and started milking again. Later on, I realized the possibility of a concussion existed. I probably did get a bit more flustered than I was willing to admit at the time. It was harder to operate after that, but I don’t blame the cow. Cows kick. That’s what they do. Shannon: Getting eliminated was a combination of so many decisions we made starting with getting the last bus. Perhaps had we chosen the condor. Shannon: It was cold out there so we figured if we got wet and even colder, it would be harder to do the next task. We didn’t know there were wet suits involved. Jody: Still, hypothermia is nothing to be trifled with. How’d you come to apply for the show? Shannon: We are both at times in our lives when we are able to do something crazy because we don’t have responsibilities. Grandma was the first to decide. It took me a little more convincing. I’m really responsible and thought I should be getting a full-time job after college, not going on TV. Jody: And I was aware that their had never been grandmother/granddaughter team on the show or someone over 70. We’re a twofer and it got us on. Did the Race change you? Shannon: I always knew I liked traveling, but I have more of a travel bug now. It also put things in perspective for me. I realized I don’t always have to be the responsible one and do what everyone does. It is okay to have adventures. Jody: In my case, I thought my life was all set. I thought I’d continue training the elderly and doing races but I have expanded my scope. I’m going to enter a half Ironman contest and I am fully committed to doing a full marathon. I want to bike through Norway and walk the Appalachian Trail. It reminds you of those dreams and to live in the moment.